Welcome to another Becoming A Modern Man! In this article I will be taking a look at Jeskai Ascendancy combo and where it is at since the banning of Treasure Cruise. My list is largely the same except some minor tweaks to the manabase, entirely down to just using the lands I had available to me. The main changes I made was swapping Wheel of Sun and Moon for Flesh/Blood. Eduardo's deck uses Wheel of Sun and Moon as an alternate win condition, combining it with Thought Scour to mill the opponent and then redraw Thought Scour. The deck is already very slow to play online and this particular mill strategy would take an extremely long time to action online. 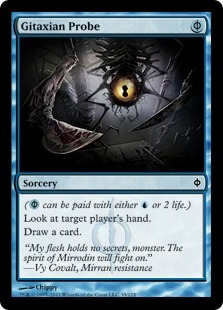 As such I chose Flesh/Blood as a substitute, the Blood side of this card is effectively a Fling without the sacrifice which we can tutor up with Glittering Wish to inflict lethal damage. Eduardo in his section of the GP Copenhagen article actually advised against playing the deck on MTGO. I guess I don't know how to listen to good advice. The problem with the deck is that there are a lot of triggers involved in going off, which take a long time to action and you are battling against the MTGO chess clock. Jeskai Ascendancy is a scarily powerful card. It turns all your non-creature spells into a +1/+1 pump and untap for your creatures and then, if that wasn't enough, it lets you loot to dig for even more spells. The untap is particularly effective when the creatures you are playing tap to make mana and nearly all your spells are cheap cantrips, allowing you run through your whole deck if necessary until your creatures are large enough to attack for lethal damage. 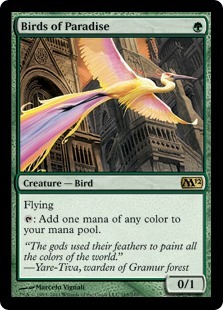 Birds and Caryatid are our mana producers. BOP is perfect as a one-mana creature that can produce any colour of mana and is also a flyer which means you can attack easily even if your opponent has mounted a ground force. Caryatid has the benefit of being Hexproof, so can't be removed when you try and go off, however, it also has Defender and can't attack. Flesh/Blood provides an answer to the problem of the Caryatid's lack of attacking ability. Fatestitcher is the real linchpin of the deck, as you can Unearth them out of your graveyard as you are going off to generate more mana and adds another hasty attacker for your kill turn. We have four different one mana blue draw spells in the deck. They all serve a similar purpose but all work slightly differently. Serum Visions is good at digging you closer to your combo pieces when you are searching for them thanks to the Scry 2. It also allows you to bottom cards you don't require as you are going off. Thought Scour is a simple draw but the mill can help put Fatestitcher, Life from the Loam and Faithless Looting into your graveyard for value. Gitaxian Probe is the card that allows you to go off on Turn 2, if you can cast a Jeskai Ascendancy off a Birds of Paradise. The fact you can cast it for free gives you a free untap and allows you to generate an extra mana when trying to go off. Sleight of Hand is a one-of. It is just an additional one-of draw spell in a deck that wants as many cantrips as possible. It also gives you draw selection. Looting is a great card for the deck. 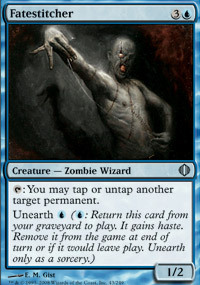 It helps dump Fatestitchers and Life from the Loams into the graveyard and digs you considerably further into your deck. Looting also can be cast with Flashback which helps prevent you fizzling out if you run out of cantrips, provided you have the mana to cast it. Manamorphose is very useful. Although it costs two mana it actually generates mana with Jeskai Ascendancy on the field as it replaces the mana it costs to cast. 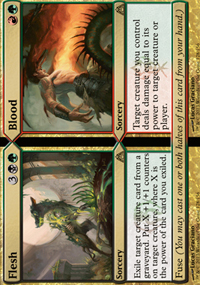 Manamorphose also provides an out to Blood Moon, which is a real problem for this deck's four-colour manabase. 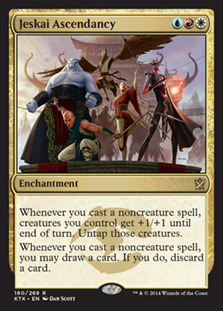 You can use the Manamorphose to fix your now all red mana and cast a Jeskai Ascendancy or one of your mana creatures. I really like Ideas in this deck. 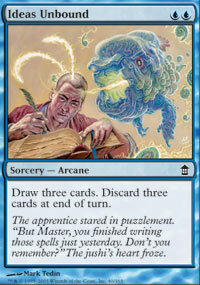 Drawing three cards is great and if you cast it on the turn you go off you'll never have to discard those cards. Drawing those extra cards not only digs very deep but also gives you more cards to pitch to Jeskai Ascendancy's loot ability. 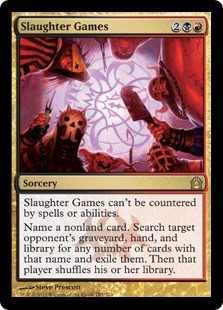 Slaughter Pact provides the deck with an answer to problem creatures. (Eidolon of the Great Revel) is a real problem for the deck, completely preventing us from comboing. Spellskite can also pose a problem as it can redirect your Fatestitcher's untap ability, preventing you untapping a land. It can be cast for free on your combo turn or it is possible to pay for the Pact if necessary. Silence is an anti-control card, preventing counterspells interrupting your combo. There are more copies in the sideboard to help deal with this. 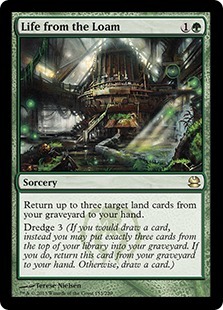 Treasure Cruise is is not but Loam has a very powerful role to play in the deck. 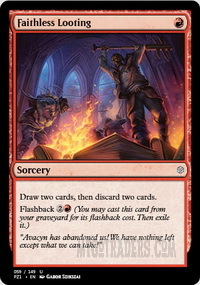 Being able to Dredge it back means as long as you're able to generate two mana you always get it back with the loot ability of Ascendancy - this doesn't let you go off indefinitely (as eventually you'll run out of cards in your library to Dredge with) but it does prevent you from fizzling will you look for other cantrips. Loam also helps fill your hand so you can better abuse Ascendancy's loot ability, pitching lands for more cantrips. Dredging is also useful as it can help put Fatestitcher's and Faithless Lootings in the bin to be Unearthed and Flashbacked respectively. Glittering Wish is probably my favourite card in the deck. 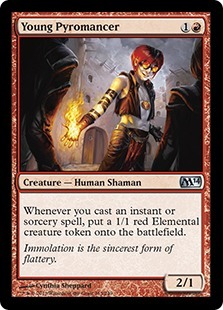 It acts as Jeskai Ascendancy 4 through 7 as it can tutor it out of the sideboard. It can also tutor up a number of silver bullets out of our sideboard (which I discuss further below). 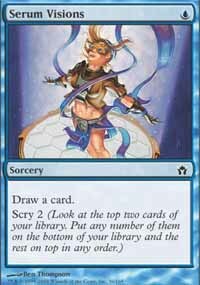 Having what is essentially a tutor for Jeskai Ascendancy is really great for the deck and the Wish sideboard means that the card can do a whole lot more, tutoring up answers to problem situations or finding cards to prevent us fizzling out. 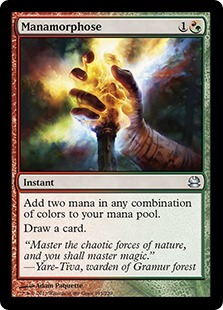 A four-colour manabase can be painful, as we require a number of fetchlands and duals. I don't really like using Mana Confluence/City of Brass/Gemstone Mine as they are something of a liability but it is very important to get our colours right early so we can cast Ascendancy. Birds of Paradise and Sylvan Caryatid help in that regard but obviously we can't rely solely on them to cast our spells. 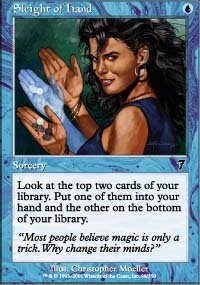 Jeskai Ascendancy is the key card in the wish board allowing you to tutor for Ascendancy with your Glittering Wish. Flesh/Blood is another key card as a potential finisher for the deck, using Blood to direct lethal damage at your opponent. This is an important option when attacking to kill your opponent is not viable. I found this to be particularly important in a format where cards like Collected Company exist allowing your opponent to drop two new blockers onto the battlefield. 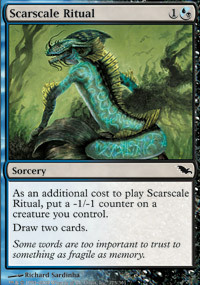 Scarscale Ritual allows you to search up a powerful draw spell that works well as you are comboing off, giving you a couple of cards. If you are at risk of fizzling out you can wish this up to restock. 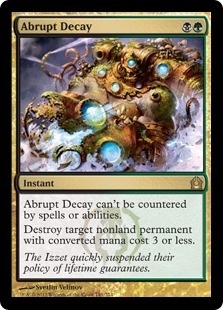 Abrupt Decay is a nice answer to various threats, including Spellskite, Eidolon of the Great Revel and various other problem cards. 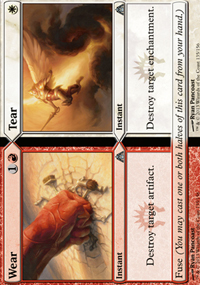 Wear/Tear again is an answer to the two cards mentioned above and numerous others. 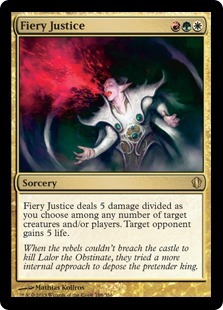 Fiery Justice can be a very powerful removal spell if required. In my time playing the deck I have yet to use it out of the board but it is a popular option in the board of Ascendancy decks. Slaughter Games can be devastating against narrow combo decks, such as our own. I'm not sure we generally have the time to cast this card - pulling threats out of the opponent's deck is good but I think we want to concentrate on comboing not being reactive. Silence comes in against Control decks or any deck with counterspells really to protect your combo. You can use it to slow an opposing deck too but I'm not sure you would bring it solely for that. Path to Exile again comes in when we need removal to answer problem creatures. 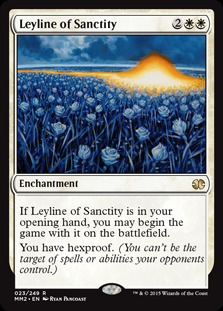 Leyline of Sanctity is a strong card against Burn decks and Jund, to protect you from being targeted by discard spells or Liliana of the Veil's +1 ability. First up I have a video deck tech for you just to quickly run through the cards again and the set out the list I am playing. Our first matchup is against Grishoalbrand. This is deck that people are very scared of it seems because it is capable of crazy Turn 1/2 wins with a nut draw. In this match I was able to combo on Turn 3 in both games, meanwhile my opponent seemed to struggle to get anything going and didn't seem to have any way to disrupt my combo. Our second matchup is against WB Tokens. Tokens in general aren't something we are too worried about. However, this particular WB Tokens deck also runs Thoughtseize and Liliana of the Veil which are serious problems for our deck. 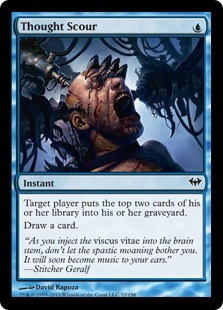 Surgical Extraction came in from our opponent's sideboard and unfortunately ruined our day. Our third matchup is against an Abzan Company deck, not sure if this deck played the Anafenza/Melira Combo or was just a value Company deck. Hand disruption hurt us in Game 1 but in general we just weren't able to draw the cards we needed in time, and we were given quite a bit of time. Game 2 and Game 3 came together a lot better for us, however, unfortunately I just fell afoul of the clock and ended up losing the match. Our fourth matchup is against RDW. This matchup is rough particularly because of Eidolon of the Great Revel being a serious problem and the fact they are so fast and apply a lot of early pressure. We need to combo fast to win this and unfortunately I wasn't able to find the answers quick enough. 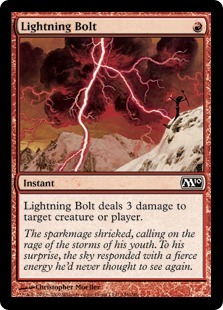 The overwhelming favourite with just under half of the vote was the classic powerhouse Lightning Bolt. An incredibly powerful removal spell and one of the most played spells in Modern (actually I think it is THE most played spell in Modern). Bolt shapes the format and a very powerful way and is apparently still much loved for it. The rest of the pack was much closer together. However, this Giant just managed to separate itself from the pack. 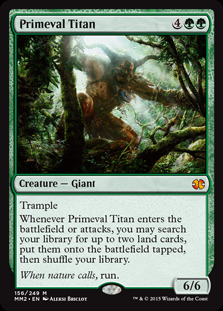 Primeval Titan is one of extremely few 6 drops that sees consistent play in Modern. A big threat and capable of powering up a number of combo decks, including Amulet Bloom and Scapeshift. Pyromancer and BOP come in joint third place each with 6 votes. Both are slightly homeless these days in Modern but they both have very powerful effects and once belonged to very prominent decks, Birthing Pod and UR Delver respectively. Hopefully one day they will find a home again. Thank you to everyone who took part. If you would like to check out the full results click here. My overall experience with the Jeskai Ascendancy deck has been one of frustration. I feel this is in part because it is a difficult deck to master and also in part because of the inconsistencies within the deck itself. I think there is a lot to learn with this deck and I do not feel I have fully got to grips with the deck despite spending quite some time practising with it. It's also a nightmare to play on MTGO and I imagine a lot easier to play in paper where there isn't a chess clock to compete with and you can take the necessary shortcuts to make killing someone not take quite so long. Playing this deck is the closest I have got to repetitive strain while playing MTGO. The combo is very powerful and can win as early as Turn 2 and a Turn 3/4 win is very reasonable to achieve. However, the variance is high and it is not too difficult to disrupt the deck with hand disruption and even graveyard hate (to deal with Fatestitcher) proving problematic for the deck. This is certainly not my style of deck and not one I would suggest trying to get into unless this is your style of deck. The deck is pretty similar to Storm, which is another deck I struggled to fully get to grips with, so if you are familiar with that deck I think that would be a big head start. As someone who is not a great Storm pilot I'm not sure how the two decks shape up against each other but personally I'd rather play Storm. That's all for this week. I hope you enjoyed this article. Magic Origins is now out online so I hope to get a chance to build some decks and write some articles about the new cards shortly.